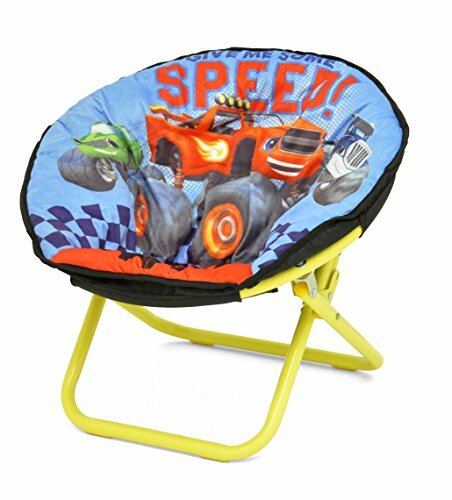 Your child can enjoy their favorite book or television show while sitting comfortably on the Blaze and the Monster Machines Toddler Saucer Chair. Its saucer shape makes it perfect for lounging and relaxing. The saucer chair is made out of a sturdy metal frame with a polyester cushioned seat for extra comfort. The saucer chair can fold together making it easy to store when not in use. It is ideal for storage and travel. It's the perfect size for toddlers and small children. Maximum weight is 81 pounds. Spot clean only. Dimensions: 18" W x 18" H x 18" L.
Ideal for reading, watching TV, and more!